This exclusive romantic itinerary offers an unforgettable rainforest experience, including the majestic Arenal volcano, beautiful beaches and landscapes. A perfect combination for those looking for comfort, relaxation and a luxury vacation for special occasions. 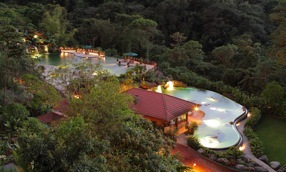 Start your exciting vacation with 2 nights at the unique Peace Lodge surrounded by exuberant rainforest, a peaceful and nature harmonious environment. 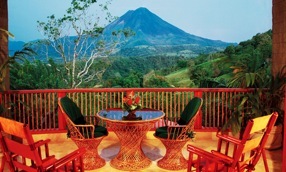 Continue with 2 nights at the most exclusive resort of the amazing Arenal Volcano zone, the Springs Resort. Immerge yourself at this natural environment and enjoy the healing mineral hot springs and the spectacular view to the impressive Arenal Volcano. 3 nights at the exclusive Tangomar Beach Resort will offer a highlight of the trip and will make of your trip one of a kind. 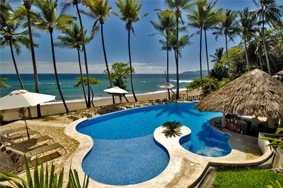 The uniquely beautiful Tango Mar Beach Hotel and Golf Resort lies within an unspoiled section of the Nicoya Peninsula of Costa Rica, and is a perfect wedding location with its newly completed beachfront event center. 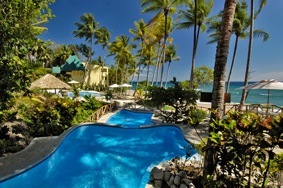 Honeymoon couples have long favored the romantic and tropical surroundings of the Tango Mar Resort. 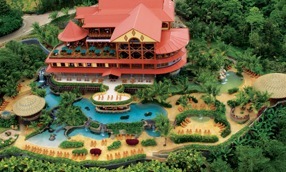 t. Guests are surrounded by waterfalls and pristine forest. The rooms are crafted masterfully to invite in the outside environment. Naturally shaped wood beams and hand laid hardwood flooring along with river stone and slate ender an atmosphere that encompasses the rustic past and natural beauty of the rainforest and Costa Rica. Each and every room boasts a Jacuzzi tub and stone fireplace along with showers that transform into waterfalls with the turn of a knob. From the handcrafted canopy beds and love seats to the original stained glass and illustrated artwork you will understand the time and care put into the details of each accommodation. There is also a garden shower and indoor shower. All of this is surrounded by beautiful indoor landscaping and illuminated by a skylight. The room also has a Jacuzzi tub and hammock on the balcony for those picture perfect star gazing nights. A grand gas fireplace to view from the king size canopy bed makes the rooms complete. There is also satellite TV, stereo system, refrigerator, and coffee maker. 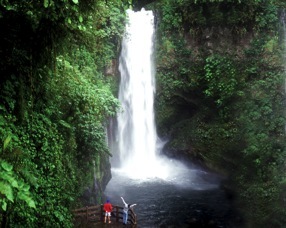 Free day to explore La Paz Waterfall Gardens, is the #1 Most Visited Privately Owned Ecological Attraction in Costa Rica featuring the best hiking near San Jose, the most famous waterfalls in Costa Rica. I has a rescued wildlife preserve with over 100 species of animals and an environmental education program. Optional guided tours are available at extra cost including private hike through La Paz, Poás Volcano, Doka Coffee Plantation, river-rafting for beginners, a boat cruise on the Sarapiquí, horseback tours, and the Center for Neotropical Studies. Overnight at Peace Lodge. Today you will have an exciting tour to choose from: Half Day Balsa Rafting or Arenal Hanging Bridges. (Rafting tour includes lunch and drinks) Back to your hotel around noon to continue enjoying the hotel´s facilities with its Natural Hot Mineral Springs, Pools & Waterfalls. The eighteen freeform, landscaped pools provide guests with great views of the volcano and a multitude of options. With temperatures ranging from 76˚F to 103˚F and environments that vary from raging waterfalls to tranquil forest experiences our guests can find the perfect pool for their mood and the current weather conditions. Tests of the hot mineral springs reveal an ideal natural combination of high bicarbonate and high chlorides with relatively low sulfur content to provide a safe and clean soaking experience. Las Lagunas (The Lagoons) Located at the base of the reception building this area encompasses two acres of lush landscaping and an assortment of multi-level sun and shade terraces surrounding twelve pools. Four of the pools are fed directly by water pumped from our Hot Mineral Springs and the other eight are chlorinated but heated to various temperatures by our Hot Springs through a heat exchange system. These pools range in temperature from 83˚F to 103˚F. Perdido Springs (Lost Springs) is a connected system of trails and seven spring fed pools located within a forest canyon just a short 100 meter walk from the lowest level of the Las Lagunas pools. The trail to these Hot and Cold Springs, called the Heliconia Walk, is lined with 150 different species of flowering Heliconias along with beautiful rainforest trees, plants and vines. In the center of these pools is a small jungle bar called Los Perdidos (The Lost Ones) along with a water flume called the Monkey Slide. These pools range in temperature from 90˚F to 101˚F. 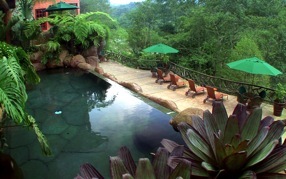 In the fall of 2010 we hope to open a second phase of pools down in the valley overlooking the Arenal River as well as a creek-fed, old fashioned, swimming hole near the river with hot springs percolating up from the sand below. Of course, the kilometer of river frontage on the property lends itself to a variety of activities including swimming, inner-tubing, kayaking, fishing and hiking. Tango Mar offers the intimate exclusivity of a small, deluxe beach resort on a vast site where you can find a space to call your own. 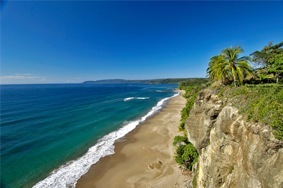 Here is a place that is charmed by a unique atmosphere, its own microclimate and favorable all year round conditions. 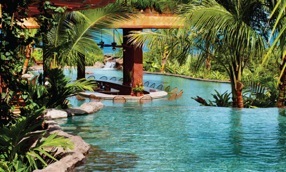 Manicured grounds and fine accommodations blend with exuberant jungle vegetation and exotic birds and animals to create the perfect balance of nature and refinement. Here you will encounter a living community with a pulse that beats in time with its natural surroundings and to the push-pull rhythm of the constantly breaking Pacific waves. Each of Our 18 Beachfront Hotel Rooms... ...has a breathtaking view... of the Pacific Ocean from its own private balcony. Features 2 queen size beds, tropical style furniture, air conditioning and ceiling fans, fully equipped mini-bar, coffee maker, private bath with hot water and large shower, safe deposit box, satellite TV and telephone. These oversized hotel rooms are right on the beach, so close to the ocean that in high tide the surf touches the base of the building and the gentle sounds of the surf put you to sleep every night. 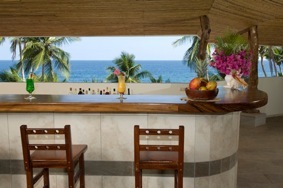 Tango Mar Romantic Package includes: Vacation in luxury at these twelve hilltop, Tiki Suites. These unique and charming rooms are surrounded by exuberant tropical gardens and are just 90 steps from the beach on a bluff overlooking the Pacific. Elegantly appointed, each suite is graced with hand carved four post canopy king size bed. All rooms have air conditioning and ceiling fans, private bath with jaccuzi, hair dryer, mini bar, coffee maker, safe deposit box, telephone and satellite TV. All suites are contained within an elliptical, shell shaped cluster and share a sun deck. All suites are furnished with fine carved wood king size beds, sitting areas, air conditioning, ceiling fans, mini bar, coffee maker, safe deposit boxes, telephones, satellite TV, private jacuzzi, hair dryer and a stained glass dome window. A driver from Tangomar will take you to local airport where you will take a flight to San Jose departing 9:00 a.m. Sansa lands at International Airport, just one block from international departures. 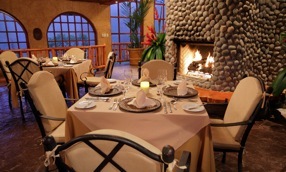 We specialize in customizing itineraries for couples and small groups. 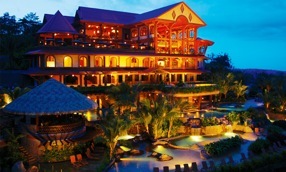 Costa Rica´s natural biodiversity itself provides a romantic setting for a perfect honeymoon getaway, while many exclusive beach and mountain hotels have been selected by different world-wide travelling authorities to be among the most romantic hotels in the world, and some of the best hotels in the world. We carefully design a selection of Romantic Getaways according to your length of stay and expectations. Let us pamper you with spectacular mountain and ocean view retreats, great combination of activities, world-class facilities, and services.